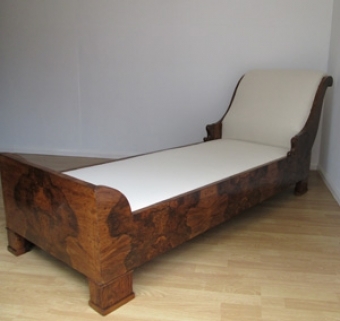 A fully restored large 19th century scroll back continental walnut day bed – burr walnut veneers, newly French polished with new traditional upholstery (coconut fibre, horse and hog hair, cotton felt and calico). A new feather mattress and lumbar cushion. This fantastic piece is incredibly stylish and will look even more stunning in the fabric of your choice. Dimensions – length 213 cms, width 72.5 cms, height 85 cms.